Prism system, Black Rise region. On the 20th of October at 20:30 EVE Standard Time, a joint Snuffed Out [B B C]\Project.Mayhem. [16-13] fleet clashed with Shadow Cartel [SHDWC] and WAFFLES. [N0MAD] in the system. 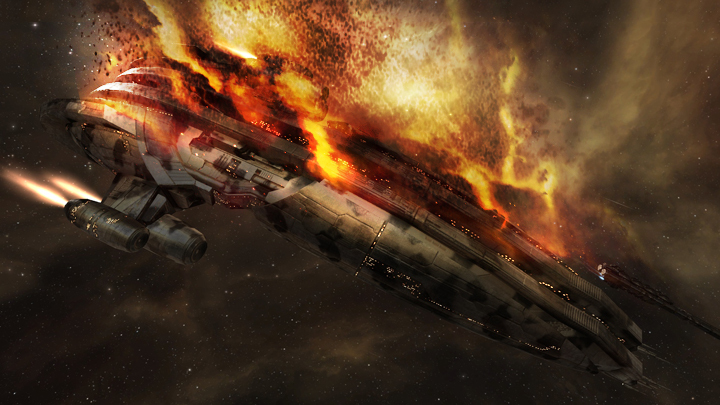 The battle was prompted by a Fortizar citadel in the system belonging to Lenny Kravitz2 which serves as part of his ambitious cluster spanning trade network. Taking exception to this, Snuffed Out\Project.Mayhem. forces reinforced the structure twice, with the engagement being fought over its armor reinforcement timer. Snuffed Out\Project.Mayhem. expected Lenny Kravitz2 to reach out to local groups to defend the citadel, and have prepared accordingly with a 190 pilot Machariel battleship fleet with a capital squadron of carriers and 2 Apostle force auxiliaries, as well as more force auxiliaries and dreadnoughts put on standby in range of the system. The fleet had also the support of a 40 pilot Red Menace Coalition (RMC) Tengu strategic cruiser fleet of 40 pilots. Against this, a joint Shadow Cartel and Escalating Entropy [CHAOS] Machariel fleet was assembled, totaling nearly 100 pilots and supported by a WAFFLES. 65 pilot Rattlesnake battleship fleet with a Minokawa force auxiliary in tow. The two fleets traveled to the system, warping to the Snuffed Out\Project.Mayhem. fleet which had already set up on the Fortizar. The two allied fleets landed one after another, merely 70 kilometers away from their enemy. Both sides wasted little to no time opening fire. The battle proved to be a brutal back and forth as artillery cannons lobbed shells across the void, interspersed with salvos of missiles. Battleships on both sides caved in to the devastating barrages laid on them by their opposition. As the battle developed, the RMC Tengu fleet entered the field, warping in at long range of the Shadow Cartel\Escalating Entropy and WAFFLES. fleets. Unlike the Snuffed Out\Project.Mayhem. fleet, the RMC force quickly burnt behind the opposing sides, targeting the fragile logistics wings of the two hostile fleets. Salvos of heavy assault missiles impacted Scimitar and Guardian logistics cruisers, overwhelming shield systems and chewing through thick armor plates, destroying the fragile hulls beneath them. This forced the Machariel fleet from time to time to divert its attention to the strategic cruisers. A few coordinated volleys often forced the Tengu fleet to withdraw to a safer distance, though it came back time and time again to harass the two battleship fleets. As this was going on, the exchange grew ever bloodier. No side was able to tank the incoming firepower, and explosions lit the grid as battleships on both sides were overwhelmed by the relentless firepower poured on them. The trade off was equal, as losses incurred by one side were instantly repaid by the other in the answering volley. The ongoing carnage proved problematic especially for Snuffed Out\Project.Mayhem. forces, as they were unable to tank the incoming fire even with the presence of 2 Apostles on the field. In order to mitigate the damage dealt by their enemies, Snuffed Out\Project.Mayhem. decided to focus on the Rattlesnake fleet first in order to force it out of the fight. Artillery cannons zeroed in on the Rattlesnakes and barrage after barrage of explosive shells smashed into their shields, enveloping them in a firestorm that quickly overwhelmed their generators and finally their exposed structure. One after the other, the Rattlesnakes were destroyed, their Minokawa unable to offer much help. One of the first casualties of this assault was the Rattlesnakes’ own fleet commander, which only served to confound the situation for the besieged WAFFLES. fleet. Regardless, the Rattlesnake fleet continued to fire back, and alongside its allied Machariel fleet managed to inflict losses in return, forcing its enemy to pay a hefty price. Yet as the exchange wore on, it was the Rattlesnake fleet which was ultimately on the verge of collapse, having lost its fleet commander and a significant number of battleships. Warping its Minokawa off to safety, the Rattlesnake fleet followed suit, leaving the Machariel fleet to fend for itself. With the Rattlesnake fleet off the grid, the battle became a personal duel between the two Machariel fleets, only interrupted occasionally by the Tengu fleet. Artillery fire was answered with artillery fire as the two fleets moved on the grid, the Shadow Cartel\Escalating Entropy fleet burning away from the the pursuing Snuffed Out\Project.Mayhem. one. The Shadow Cartel\Escalating Entropy fleet focused most of its firepower on the support wing of the Snuffed Out\Project.Mayhem. fleet as it attempted to slow down its anchor, thus putting the entire fleet in peril while the latter continued to pummel their enemies’ mainline ships. In the middle of this, the Rattlesnake fleet tried to make a comeback, warping to the grid at range of the hostile Machariel fleet. However a couple of losses later discouraged it from resuming the fight and it finally extracted from the system. By then the Shadow Cartel\Escalating Entropy fleet was bleeding ships profusely while its opponent was able to tank the incoming damage far better. With the trade off between the two sides growing ever more favorable for Snuffed Out\Project.Mayhem., and the number of its allies dwindling, the Shadow Cartel\Escalating Entropy fleet commanders had no choice but to concede the field and withdraw their forces. This left the grid under the control of Snuffed Out\Project.Mayhem., which promptly dispatched the last of the stragglers before reinforcing the vulnerable citadel and pushing it to its final reinforcement mode. With both the field and the objective won, the Snuffed Out\Project.Mayhem. force and its allies departed the system, bringing the fight to an end. Battle report for the Prism system can be found here. All told the battle lasted 40 minutes with Time Dilation not reported and the system hosting 400 pilots at the peak of the fighting. Shadow Cartel \ Escalating Entropy and WAFFLES. lost a combined total of 46 ships including 27 battleships for a sum of 28.66 billion ISK damage. Snuffed Out \ Project.Mayhem. and RMC lost a total of 41 ships including 16 battleships and 9 strategic cruisers for a sum of 24.67 billion ISK damage.